The SDK comes with three example applications, two written in C# and one in C++ (MFC). All projects are located in the "My Documents\scConverter SDK\examples" folder. Full source code and corresponding project files can be found as subfolders to this folder. You can also find sample code on our support forum: scConverter Samples. This C# sample demonstrates how to create a new PDF by merging different PDF files. 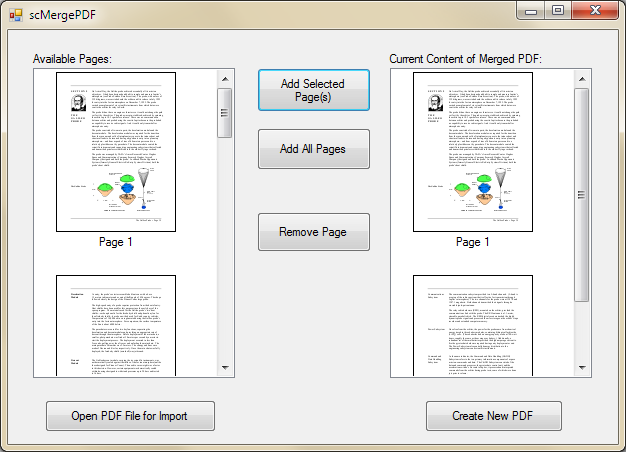 Using the scConverter merge functionality you may include all pages, or individual pages, from the source PDF files. This application is very easy to use; you open different PDF files one by one using the Open PDF File for Import button. After the file is opened a thumbnail of each page in the file will be listed in the left page list. You may then either add all pages using the Add all Pages button, or select one or more of the pages in the left page list and then add these using the Add Selected Page(s) button. When all desired files and pages have been added, you may create the new merged PDF file using the Create New PDF button. The MFC/C++ sample application is a fully working Batch Converter utility using the scConverter to do the actual conversion. With this application you can select files to a batch list, select output format and destination folder and finally batch convert all the files in the list. This C# sample application is a very simple command line converter that accepts three arguments: Input filename, output filename and a format identifier. The format identifiers are the same as those accepted by the Convert method. The include file (scConverterItf.h) for the scConverter are located in the "My Documents\scConverter SDK\examples\lib" folder. In the same folder you will find one directory for the 32-bit import library (x86) and/or one directly for the 64-bit import library (x64). You will also find the scConverter.tlb file in this folder. A set of sample files are are located in the "My Documents\scConverter SDK\samples" folder. You may use these files to test the sample, or your own, applications.